Shortly after 9/11, the administration of George W. Bush moved to tighten “border security,” ultimately leading to the adoption of the Secure Fence Act in October 2006 that created a fortified wall and a virtual fence (with sensors and cameras) over 700 miles of the 1,990-mile U.S.-Mexico border. A policy of massive deportations, punctuated by workplace raids, accompanied the expansion of the border fence. Over the eight years of the Obama administration, more than 3 million people from Mexico and Central America were deported. During this same period, hundreds died of heat exhaustion in the burning Arizona desert trying to secure a better life for their families. Many more were gunned down by vigilantes, whose crimes often went unpunished. 700,000 per year, more than double the number under the Obama administration. This Wall of Shame, as it is called on both sides of the border, is the outcome of more than 20 years of U.S.-imposed “free trade” policies (NAFTA and CAFTA, in particular) that have destroyed Mexico’s economy, turning a sovereign nation into one big maquiladora pass-through sweatshop for the transnational corporations. These policies have forced millions of Mexican and Central American peasants, workers, and youth to flee to the United States in the hope of finding a way to feed their families. In Mexico, NAFTA has been the main weapon of the U.S. transnational corporations to promote so-called “reforms” — in reality counter-reforms — aimed at privatizing railroads, Mexico’s national oil corporation (PEMEX), telecommunications, electricity, mining, public education, and other public enterprises and services, including healthcare. NAFTA destroyed the nation’s agricultural production; today 45% of what is consumed in Mexico in basic products comes from abroad. Mexico now depends on the United States for beans, corn, rice, sugar, and wheat. NAFTA also destroyed Mexico’s meat industry; U.S. imports of meat have grown by 750 percent over the past 25 years. It must be said and repeated: All U.S. administrations beholden to the corporate “free trade” agenda are responsible for the mass migration to the United States of workers, peasants, and youth from Mexico and Central America! The Wall of Shame and NAFTA represent an assault of the sovereignty and people of Mexico, but they also represent an assault on workers and entire communities in the United States, where full-time jobs with benefits have been destroyed and unions have been dismantled under the bosses’ threats to shut down and outsource the plants to countries with lower wages south of the border. Today, Trump and Mexican President Enrique Peña Nieto are talking about “renegotiating NAFTA.” In some quarters, illusions have been sown that this could mean improvements for working people on both sides of the border. Nothing could be further from the truth. Trump promised to break with Wall Street to help Main Street; instead he filled his cabinet with Wall Street execs. He promised to improve healthcare; instead, he is seeking to dismantle Medicaid and take away healthcare coverage from 23 million low-income people to line the pockets of his billionaire cronies. 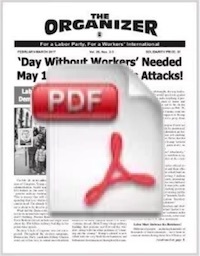 He promised to defend workers and their jobs; instead, by pushing a federal “right to work” (for less) law, he has set out to dismantle the only organizations through which workers are able to preserve their jobs and benefits: the trade unions. Trump is out to “renegotiate NAFTA” — but only to benefit U.S. corporations, NOT to benefit workers in Mexico or the United States. The new agreement that Trump is pushing will only deepen the attacks on working people and their organizations, primarily their unions. Meanwhile, in Mexico, Peña Nieto has appointed Luis Videgaray as his foreign-relations secretary; he is the man who will be “renegotiating” NAFTA. Videgaray is Wall Street’s man in Mexico. As Peña Nieto’s former Secretary of Finance and Public Credit, he has implemented all the counter-reforms that are destroying the Mexican nation in the interests of the U.S. banksters and their Mexican junior partners. Rather than stand up to Trump to defend Mexico’s sovereignty, these country-selling politicians are offering to do Trump’s bidding, with an occasional whimper of protest (to save face). 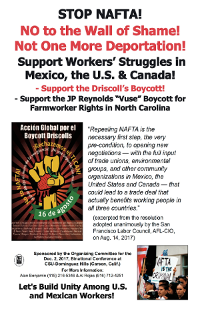 More than ever, workers and youth need to reach out across the border and unite in an independent struggle to tear down the Wall of Shame, stop NAFTA and CAFTA, and stop and reverse all the policies emanating from the “free trade” corporate agenda. We have the same interests, and we are waging the same struggles to protect our interests as working people. 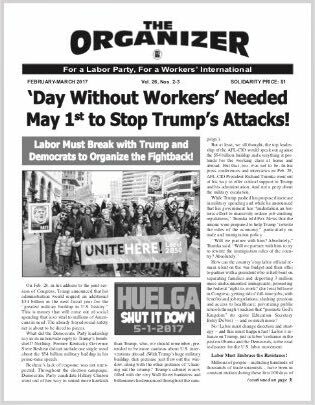 To promote this cross-border fightback, we, the undersigned unionists and activists call upon our sisters and brothers on both sides of the border to endorse this appeal and promote it as widely as possible among your labor and community organizations. Let’s work together to build a broad-based binational conference around these common demands, the date and place to be determined by the initial signatories. • Tear Down the Wall of Shame! • Not One More Deportation! • Stop NAFTA and CAFTA! • Stop All Privatizations and Counter-Reforms! Collective Bargaining on Both Sides of the Border! Baldemar Velasquez, President, Farm Labor Organizing Committee (FLOC, AFL-CIO), Toledo, OH; Alan Benjamin, Member, Continuations Committee, Mumbai Conference Against War & Exploitation, Delegate, SF Labor Council, San Francisco, CA; Eduardo Rosario, President, New York City Labor Council for, Latin American Advancement (AFL-CIO), Brooklyn, NY; Nativo Lopez, Senior Advisor, Hermandad Mexicana Nacional “La Original”, Los Angeles, CA; Chris Silvera, Secretary-Treasurer, Local 808 International Brotherhood of Teamsters, Long Island City, NY; Nancy Wohlforth, Secretary-Treasurer Emerita, OPEIU, Washington, DC; Al Rojas, LCLAA-Sacramento AFL-CIO, Sacramento, CA; Saladin Muhammad, Southern Workers Assembly, Rocky Mount, NC; Rolando Revilla Jr., FLOC, Toledo, OH; Colia Clark, National Coordinator , Judicial Violence Symposium, Harlem, NY; William I. Robinson, Professor of Global and International Studies, UCSB, Santa Barbara, CA; Sara Flounders, Co-Director, International Action Center, New York, NY; Erin McKee, President, South Carolina AFL-CIO, Mt. Pleasant, SC; Joe Lombardo, Co-Coordinator, United National Antiwar Coalition (UNAC), Delmar, NY; Clarence Thomas, Past Secretary-Treasurer (retired), ILWU Local 10,, Co-chair, Million Worker March Movement, Oakland, CA; Rodrigo Toscano, Labor Institute / United Steelworkers, National Projector Director for Health, Safety, and Environment, New Orleans, LA; Donna Dewitt, President Emeritus, South Carolina AFL-CIO, Swansea, SC; Katherine Black, Co-Convener, US Labor Against the War, Philadelphia, PA; David Swanson, Director of World Beyond War, , Campaign Coordinator of RootsAction.org, Charlottesville, VA; Nnamdi Lumumba, State Organizer, Ujima People’s Progress Party, Baltimore, MD; Gene Bruskin, Co-Founder, USLAW; trade unionist, Silver Spring, MD; Jim Lafferty, Executive Director Emeritus, National Lawyers Guild, Los Angeles, CA; Mary Prophet, Member, USLAW Nat’l Steering Committee, Delegate, Alameda County Labor Committee, Berkeley, CA; James M. Wallrabenstein, Social Justice Activist, Spokane, WA; Ralph Schoenman, Taking Aim, Vallejo, CA; Mya Shone, Taking Aim, Vallejo, CA; Allan Fisher, AFT 2121 delegate to , San Francisco Labor Council, San Francisco, CA; Traven Leyshon, President, Green Mountain Labor Council, AFL-CIO, Montpelier, VT; Julia John, Ujima People’s Progress Party, Baltimore, MD; Laurence H. Shoup, UAW 1981 ret., Oakland, CA; Melina Juárez, Ph.D Candidate, University of New Mexico, Albuquerque, NM; Dennis Gallie, UAW 249 retired member, Kansas City, MO; Rodger Scott, Past President, AFT 2121, Current Executive Board Member & Delegate to the San Francisco Labor Council, San Francisco, CA; Jerry Levinsky, Steering Committee, Labor Fightback Network, Member, SEIU 509, Amherst, MA; Haldon C. Sutton, Executive Board Member at Large, SW Florida UAW Retired Workers Council (for id only), North Port, FL; Larry Duncan, CWA 14408 (Retired), Chicago, IL; Lindsay Curtis, Editorial Board, The Organizer Newspaper, Sacramento, CA; Elizabeth C Wright, Social justice activist, San Francisco, CA; Steve Early, Member, Richmond Progressive Alliance, and , Pacific Media Workers Guild/News Guild/CWA, Richmond, CA; Thomas Bias, National Secretary, Labor Fightback Network, Flanders, NJ; Gayle McLaughlin​, Former Mayor of Richmond, CA and Candidate for Lt. Governor of California 2018​, Richmond, CA; Timothy Stinson, Socialist Organizer, Albany, OR; Don Bryant, Greater Cleveland Immigrant Support Network, President, Cleveland, OH; C. T. Weber, Peace and Freedom Party of California, , Legislative Committee Chair, Sacramento, CA; Mark Weber, Social justice activist, Cleveland, OH; Dan Kaplan , Executive Secretary, AFT Local 1943, , the San Mateo Community College Federation of Teachers, San Mateo, CA ; Michael Carano, Teamsters Local 348, retired, Tallmadge, OH; Carol E Gay, President, NJ State Industrial Union Council, Brick, NJ; Jeffrey Segal, National Organization of Legal Services Workers, UAW Local 2320, Louisville, KY; David Walters, Member, IBEW 1245 (retired), San Francisco, CA; Millie Phillips, Steering Committee, Labor Fightback Network, Oakland, CA; Todd Jelen, Member, American Federation of Musicians (AFL-CIO), Brook Park, OH; Sarah-Emily Carter, Administration Assistant, South Carolina AFL-CIO, Swansea, SC; Mary Findley, Vice Chair, Lorain County Forward, Amherst, OH; Michael Fanderys, Peace Action (retiree), Cleveland, OH; Cindy Fanderys, Peace Action (retiree), Cleveland, OH; Cindy Sheehan, Executive Director, Cindy Sheehan Soapbox, Vacaville, CA; Bill Shields, Member, AFT 2121, San Francisco, CA; Barry Hermanson, SF Green Party, San Francisco, CA. Luis Carlos Haro, OPT Tijuana; Fernando Serrano Monroy, Secretario General del Sindicato Único Independiente de los Colegios de Bachilleres de Chiapas SUITCOBACH; Mario Roldán Robledo, Dirigente del Consejo Central de Lucha de la Sección 40 SNTE – CNTE; Muriel Gómez, Dirigente del Consejo Central de Lucha de la Sección 40 SNTE – CNTE; Daniel Gómez Mesa, Nueva Central de Trabajadores Sindicalista de la Sección 7 del SNTE- CNTE, región Frontera Comalapa; Daniel Martínez Velasco, Comisión promotora de la Nueva Central de Trabajadores sur sureste de México; Raúl Drouvalliet Patiño, Coordinadora Nacional de Petroleros Mexicanos, Villahermosa, Tabasco; Mario Díaz Ortega, Coordinadora en Defensa de PEMEX, Minatitlán, Veracruz; José Raúl Calleja Lacorti, Coordinadora Estatal Democrática de la Sección 50 de SNTSA; Fredy Rodríguez Méndez, sindicalista Sección 7 SNTE- CNTE; Roger Cerda Medina, Secretario de Organización de la Delegación D-IV 9 Jubilados y Pensionados; Carlos Misael Palma López, CORCI México; Melquiades Velueta Velueta, Coordinadora Democrática de la Salud, Sección 50, SNTSA, región Palenque, Chiapas; Russel Aguilar Brindis, Secretario General Delegacional Escuelas Secundarias Técnicas, Sección VII SNTE-CNTE; Gilberto Montes Vázquez, OPT Chiapas; Wilner Metelus, Presidente del Comité Ciudadano de Defensa de los Naturalizados y Afroamexicanos; Comisión Ciudadana de Derechos Humanos del Noroeste, A.C; Hugo Castro Vázquez, Coordinador de la organización Ángeles sin Fronteras en Baja California; Mónica Acosta Zamora, National Political Campaign for the Freedom of Ramsey Muñíz; Unión General de Obreros y Campesinos de México Bandera Roja; Guillermo Almeyra, escritor y periodista; Sara Fernández, Grupo Gestor Águilas de Baja California, Tijuana; Cirilo Gómez, profesor Tecate; Asociación de Padres por una Educación de Calidad, Tijuana; Ubaldo Rosas Valladeres, Jornalero Agrícola San Quintín; Alejandra Rivera Arvizu, OPT Tijuana; María Rivera, OPT Tijuana; Joaquín Torres, OPT Tijuana; Christian Santana, Estudiantes en Defensa de la Educación Pública; Juan Carlos Vargas, CORCI México; Jesús Casillas Arredondo, OPT Mexicali; Carlos Rosales, Profesor de UABC; Manuel Hernández, Profesor de preparatoria, BC; Abril Angélica Rodríguez Martínez, activista en el movimiento feminista y en defensa del agua, Mexicali, Baja California; Juan Antonio Avalos Rojas, STUNAM; Eduardo Félix, Estudiante San Luis Rio Colorado, Sonora; Erick Omar Jimenez Campaña, estudiante UABC; Liliana Plumeda, OPT Mexicali; Marco Morales, Activista de Mexicali Resiste; Teresa Saavedra Talavera, Partido Popular Socialista de México; Laura Benítez, Movimiento Ateo Feminista Internacional; Emiliano Raya Aguilar, Movimiento de Izquierda Revolucionaria; Ismael Ruiz, Asistente de Investigación.